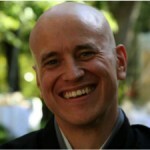 Bussho Lahn is a Certified Spiritual Director, an ordained Soto Zen Buddhist priest, and a senior teacher at the Minnesota Zen Meditation Center. Bussho is grounded in contemplative spirituality, interfaith experience, addiction recovery, and shadow integration. He is experienced in pilgrimage and retreat facilitation, and public speaking on a variety of spiritual subjects. His special interests include ritual and ceremony, poetry, and interfaith dialogue. He has been connected to Aslan Institute for nearly 20 years and is currently Aslan’s office manager. At Aslan, Bussho connects with and mentors those who wish to deepen an intentional and contemplative spiritual life. He sees the intimate connection between our deeply held spiritual beliefs and the workings of our day-to-day mind and heart. The connection between spirituality and psychology is the area Bussho explores with his clients, as well as encouraging and supporting their continued spiritual lives, regardless of their faith tradition. Bussho also teaches meditation, mindfulness, and the basics of Zen Buddhist practice and philosophy, as well as leading the regular Saturday Aslan meditation retreats. He lives in Eden Prairie with his wonderful wife Karen. Please email Bussho for further information. Click here to read an interview with Bussho.